Join the members of the Carman Fire Department and the City of Schenectady in Honoring “Hometown Hero” Richard Farry. Rich was born in Schenectady and proudly served Rotterdam as a member of the Carman Fire Department. Rich served in many capacities including Chief, President and Commissioner during his tenure. Rich also served in The United States Air Force earning the rank of Sargent. 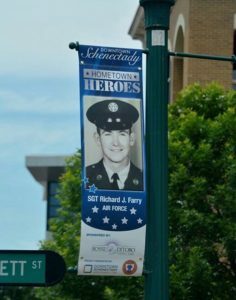 We encourage everyone to visit the Hometown Heroes banners displayed on State Street in the city until Veterans Day 2017.